Natural herbal and plant-based remedies with antiviral, antibacterial and immunomodulating properties can have significant therapeutic value in optimizing health. Some remedies work on conditions for which Western doctors have no pharmaceutical drug. Chinese herbal therapy takes a holistic approach to understanding normal function and disease processes and focuses as much on the prevention of illness as on the treatment. Most traditional Eastern medicine herbal formulas combine eight to twelve Chinese herbs and may be prescribed in pill or extract form or as dried herbs concocted to make a drinkable tea. Yes. When prescribed by a trained and licensed practitioner, herbs are extremely safe. What conditions are herbs used for? Chinese herbs have been used to treat everything from the common cold and influenza, to acute trauma and injury, to chronic illness and parasites. There are many conditions in which herbs are more effective than acupuncture alone. This includes such things as dermatology, gynecology, hormonal imbalances, autoimmune disorders, cancer support, and internal medicine. There are many different ways of taking herbs. The strongest and most traditional way of taking herbs is to cook them fresh each day on your stovetop. You can also take herbs as a powder mixed with hot water (similar to instant coffee or tea), in capsules, or as pre-cooked and pre-measured liquid vacuum packs. 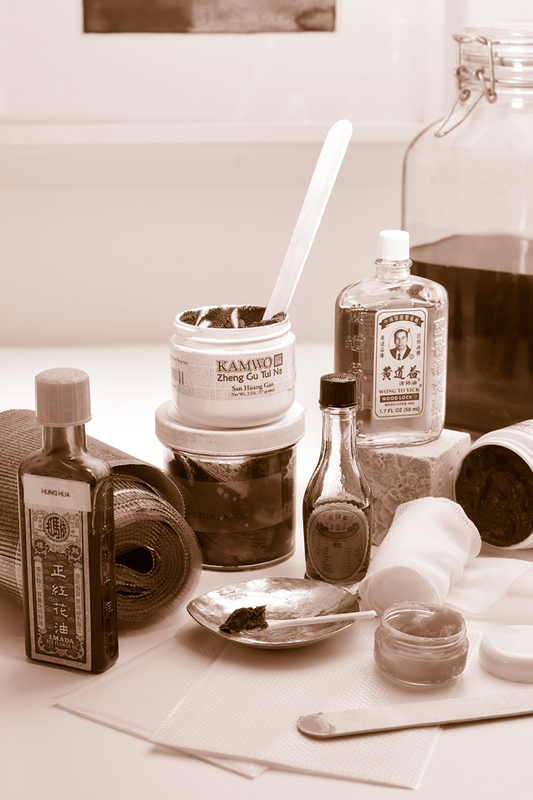 For many acute trauma and orthopedic conditions, externally-applied herbal soaks, plasters, ointments, or patches may also be prescribed when necessary. How long should I expect to be taking herbs? Herbal prescriptions are custom made for each patient on a case-by-case basis and therefore the treatment plan and duration will depend on the presenting condition as well as other lifestyle factors that may influence the course of treatment. For many acute conditions, the effect should be immediate, with an individual’s prescription changing as the condition changes. For chronic conditions, it is common for patients to use herbal therapy for weeks to months at a time until a satisfactory state of health is achieved. Occasionally, herbs are recommended as a maintenance measure for chronic intractable conditions.